Melrakki is the Icelandic name for the Arctic Fox. It also goes by the names tófa and refur, the last of which means fox in general. The Arctic Fox is the only mammal that arrived in Iceland on its own device. All other mammals have been brought here by humans. The fox is believed to have arrived in Iceland during the last ice age across the ice covering the entire arctic circle. The Arctic Fox is a rather small fox comparing to European or American foxes. They have evolved this way to reduce the heat loss by reducing the skin surface. Just like other animals native to Iceland, the fox has thicker fur in winter to adapt to the cold climate of winter. Due to this thick fur, the can endure temperatures as low as -35°C (-31°F) without increasing their metabolism. Only when the temperature drops below -70°C (-94°F) the foxes metabolism has doubled and they start to tremble to produce heat. 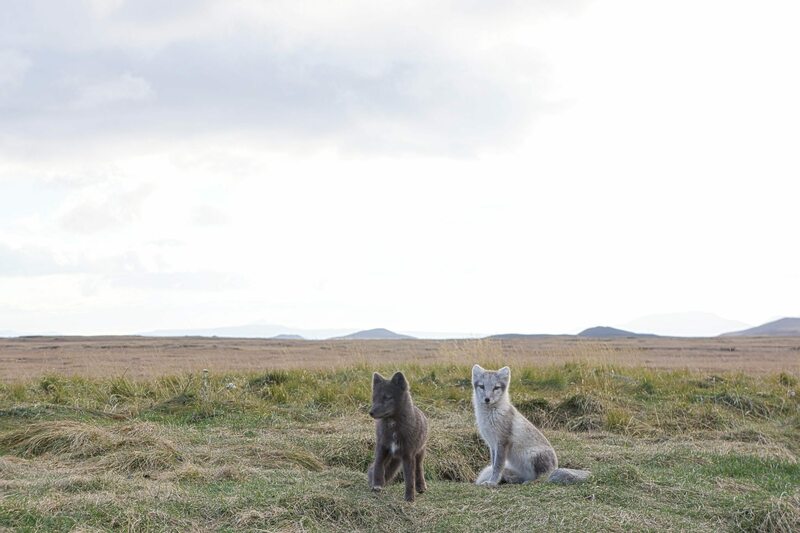 The majority of the foxes in Iceland change colors between seasons. They are white in winter to camouflage in the snow and in summer it is dark brown on the back and lighter on the stomach. There is also another variety that is brown the entire year. But this variety is not as common as the other one. In Iceland, the diet of the Arctic Fox consists mainly of birds and eggs. They also eat mice as well as larger animal carcasses they come across. The foxes mate for life and each couple marks their own territory where they make their home. They create holes in the ground within their territory and it’s in those holes where the cubs grow up. The territory also marks their hunting ground and for that reason, it is very important for them to chose a good territory as that will define their success. The foxes live all across Iceland but they are not always easy to find. The Hornstrandir nature reserve is the best place to see them in their natural habitat. In Hornstrandir, they are protected from hunting. For that reason, there is a large fox population in that area.